The Wintrillions website is owned and operated by Ledonford Ltd. Ledonford Ltd have been operating for over 7 years and have customers in over 140 countries. 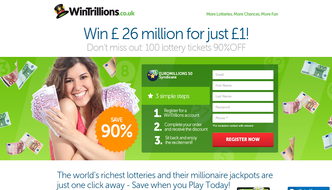 Wintrillions is one of the world’s biggest lottery websites. The site allows players from around the world to play some of the biggest lottery syndicates and Millionaire raffles. They are currently rated number 1 for lottery syndicates games internationally. They offer the biggest and best international lottery games in their syndicates with the largest cash jackpots. All games are regulated by the governments in which the various lotteries operate. By registering with WinTrillions today you will get access to their exclusive 2018 special offer. 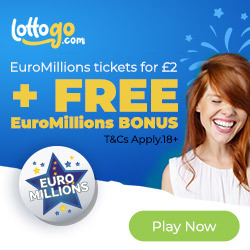 By paying just $1 / £1 you will get to play in their EuroMillions Mini Syndicate draw for 2 weeks. 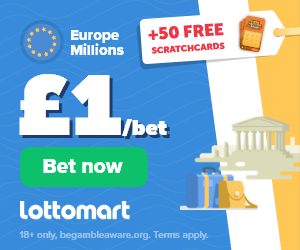 That will give you 100 syndicate entries into all EuroMillions draws (Tuesday and Friday) at a massive 90% off the normal price. Please note that your discount will only show up on the payment page before you place your order. Your subscription does not automatically continue thereafter unless you choose to buy more entries. After joining you are automatically enrolled in their VIP Loyalty Program. For every syndicated lottery or millionaire raffle tickets that you buy through the site will earn you loyalty points. These points can be used to get special discounts, bonuses and gifts. You get 1 point for every $1 / £1 you spend on the site and $1 / £1 off for every 25 points you collect. If you collect enough points it’s possible to get a free month’s lottery subscription. Wintrillions lets you play in numerous lotteries from all around the world. You can play with a group of people known as a syndicate who pool their resources buying more entries and sharing winnings between each member. Buying as a syndicate significantly increases your chances of winning a prize. Your odds of winning a prize are significantly enhanced due to the fact that you are buying more entries for each draw. Recent statistics have shown that 1 in 3 syndicates win a jackpot. The various syndicates that you can join are split up by either a single lotto or a group of lotteries within a country or continent with the exception of the Power Combo which includes USA and Italian lottos. Depending on which syndicate you buy shares for will depend on how many people are your group. The number of people per syndicate varies from 20 – 50 but full information is shown before you purchase the tickets. If you win a cash prize then it is split between the number of people in your group based on how many shares you decided to buy. After purchasing a syndicate share(s) you will be sent an instant email confirmation. Your entries will then be purchased by their local office. Scanned copies of your ticket(s) will be uploaded to your account so you can view them at any time. The original tickets will be stored securely by their auditors. To make a deposit you can use Visa, Mastercard or AMEX. Alternatively, you can use JCB, EntroPay, checks, Skrill (Moneybookers), Ukash plus many other major online payment providers. (Check website for details) Alternatively, you can use bank transfer and your order will be processed once your payment has been confirmed. If you win any amount below $600 / £500 it will be deposited to your Wintrillions account. You can then choose to withdraw it or use to buy more plays through the website. If you win any amount over $600 or possibly even the jackpot then you will be contacted with instructions on how to claim your money. You are guaranteed to receive 100% of the prize money when you win. There will never be a charge to claim your prizes.